Gwendolyn Brooks's daughter, Nora Brooks Blakely, gave a speech at the opening night of "Centennial Brooks" last Thursday. 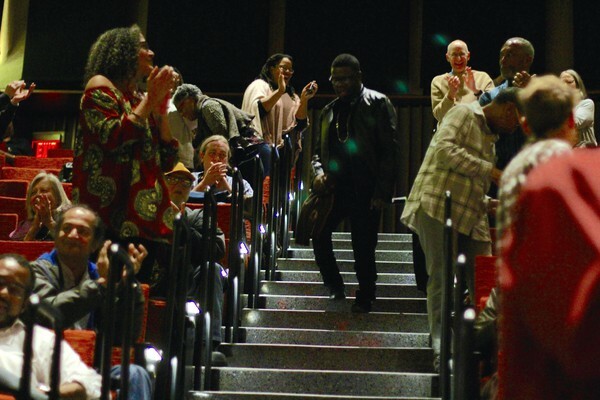 Last week, writers, scholars, musicians, and readers congregated in Hyde Park to celebrate the life and legacy of poet Gwendolyn Brooks through “Centennial Brooks,” a collaboration between the University of Chicago, the DuSable Museum, and the Poetry Foundation. Preparations for “Centennial Brooks” began two and a half years ago when John Wilkinson, chair of the Committee on Creative Writing, asked Bill Brown, Senior Adviser to the Provost for Arts, how the University planned to celebrate Brooks’s legacy. It evolved into a three-day event that kicked off Thursday night at the DuSable. The opening featured such speakers as poet Sonia Sanchez and Brooks’s own daughter Nora Brooks Blakely. 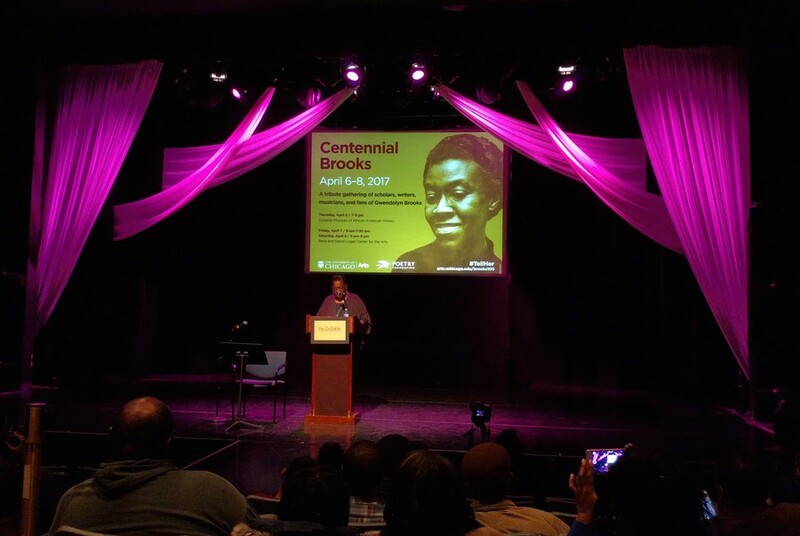 The Centennial continued on Friday and Saturday with panel discussions, roundtables, and poetry readings. Saturday evening finished with a concert featuring Jamila Woods and original music composed by flautist Nicole Mitchell, which she performed with her Black Earth Ensemble. Brooks grew up in Bronzeville, roughly a 10-minute drive from Hyde Park. According to Saturday’s panel, “Chicago, Race and Space,” Chicago’s landscape and local issues informed Brooks’s work for the rest of her career. Her focus never strayed far from Chicago—she wrote her first book of poetry, A Street (1945), in Bronzeville, became the first African American to receive the Pulitzer Prize for Poetry in 1950, and held the honor of Poet Laureate of Illinois from 1968 until her death in 2000. Such details, however, only skim the surface of her legacy. “Centennial Brooks” revisited Brooks’s poetry to unearth new insight into her extraordinary body of work. On Saturday, poets gathered to study poems, including In the Mecca, in historical context. Brooks wrote during the Black Arts Movement and the Civil Rights Era, and the panels “On Rioting and Riot” and “Black Arts & Music/Performance” fleshed out these periods to shed light on her poetry. True to her belief that poetry has a future, the injustices Brooks wrote about continue to this day. In “Patrick Bouie of Cabrini Green,” Brooks calls a young man killed in his teens “our interrupted man”—a phrase that Nora Brooks Blakely believes speaks to the many young men still dying in the streets. “Her calling was clear: to write,” said Chicago-based poet Angela Jackson. Beyond putting pen to paper, the Black Arts Movement also emphasized performance, which was in many ways the highlight of the “Centennial Brooks” events. Blakely gave a breathtaking reading of “We Real Cool” on Thursday’s opening night, stressing that the word “we” in the poem is meant to sound like a gasp at the end of the line, like people “reaching for their last breaths.” On Saturday evening, Jamila Woods performed songs from her 2016 album HEAVN and spoke of how Gwendolyn Brooks’s advice to write about “what’s under your nose” informed her songwriting process. Nicole Mitchell’s ensemble transformed poems such as “Riot” and “To the Diaspora” through her commissioned piece, Gwendolyn Brooks: New Art and Anthem. At the end of the concert, the poet Avery R. Young invited the audience to dance with him as he walked around the performance hall, bringing the crowd into the performance. The sense of community captured in that moment was a spirit that Brooks captured in her work. Moving through the hall, avery r. young invited the audience to dance with him for the last song of the night. “We Real Cool” is Brooks’s most widely circulated poem and Blakely even insisted that Seasons: A Gwendolyn Brooks Experience, published in honor of her mother's centennial, should be designed so that it opens to direct center with “We Real Cool” (a challenge that led certain designers to withdraw from the project). “Working things out as one is something that continues to wander through my mother’s work,” Blakely said. The magnitude of coming together was certainly realized throughout the three-day event, as scholars and fans alike gathered to pay tribute to a poet whose work—both literary and philanthropic—left an indelible influence on them. Brooks is, without a doubt, a literary giant. At every event, a larger-than-life image of her was projected onto the screen before the audience. But she was more than a giant; she was a cultural mother to many, “Sister Gwen,” a contemporary among writers during the Black Arts Movement, a poet who is remembered for her poetry and humanity. Nearly every presenter had something to say about how Brooks—not necessarily her work, but simply her as a person—moved them. Brown remembered how he was invited to a faculty member’s home during his fourth year to hear Brooks read her work, and later had the opportunity to visit her home. Deborah Nelson, associate professor at the Department of English Language and Literature, moderated the “Female Contemporaries” panel on Friday afternoon. She recalled how Brooks once gave her a signed copy of Children Coming Home to thank her for being the emcee of the Illinois Emerging Writers Competition on campus. Brooks left behind not only a body of work, but also a legacy of kindness that captures why she was and remains so loved. “Centennial Brooks” at UChicago formally ended on Saturday night, but will continue throughout the year. The Logan Center will present BrooksDay@Nite on June 7, the anniversary of her birth, with 100 one-minute performances to celebrate her birthday. POETRY Magazine’s June issue will also be published as a tribute to her. Her poems will undoubtedly continue to be studied in classrooms around the world for generations to come. But perhaps the best way we can honor her is by carrying on not only her work, but also her compassion. One can learn much about Bronzeville and the social climate of the 1960s by reading Gwendolyn Brooks’s poems. But as the events that took place over the weekend show, the best way to pay tribute to her is to embody the spirit of “we”—to come together as a community, to be kind, to be “each other’s magnitude and bond.